The summer of 1998 we went off to have one of “Ann and Phil’s Excellent Adventures” in California and as far north as Vancouver, BC. Since there have been more birds seen in California than in any other state, it was high on our list of places to visit. One of the perks of being a “school marm”, as Phil likes to say, is that you can usually get summers off to travel – which is what we usually do. That summer, one of our target birds was the illusive LeConte’s Thrasher – a pale brown, 11 inch-long bird with a curved bill as long as its head, named after Dr. John L. LeConte (1825-1883), an entomologist. At this point in our birding careers, we both had seen all 8 of the species of thrashers that live in North America – except one – the LeConte’s Thrasher. We had looked for this bird several times on previous trips, but had come up empty handed. Maybe this time would be different! As is our custom, we start planning for our trips months in advance. When possible, we try to get birders’ guide books that tell us specifically which birds can be seen where we’ll be traveling. If you’re not a birder, you probably think, “Well, how could anybody possibly know where a particular bird is going to be?” Trust me, birders know! And the experts write detailed books covering the locales they’re familiar with, describing in detail (with maps) exactly what town or park or road to go to for a particular bird, how to get there, and sometimes even what tree or utility pole the bird nests in – AND the best time of day to see it! 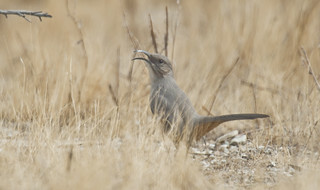 But even so, we had still not seen the LeConte’s Thrasher. So, we got our traveling library together, making sure we had a copy of the Birder’s Guide to Southern California (which covered some of the areas we’d be exploring), current AAA tour books, an up-to-date copy of our favorite Road Atlas: Adventure Edition by National Geographic, and a copy of the pertinent Lonely Planet Travel Guide. (Check out these excellent guidebooks at lonelyplanet.com) One advantage of belonging to a network of birders is that they are always willing to help out-of-towners find birds, and nowadays this pre-trip planning has been made even easier through the internet and smart phones, with continual up-to-the-minute birding reports of what birds are being seen where. Another concern was reservations – for ferries, for boat rides to islands, for pelagic trips on the ocean to see birds, for accommodations recommended in “birdy” places, etc. So a lot of research goes into our birding adventures – and fortunately, that process is in many ways as exciting and satisfying as the trip itself – reading up on the places we’ll be, what birds we’re likely to see, studying the birds we could see, planning our routes, and always including such places as national parks, national wildlife refuges, and other outstanding natural sites. The National Geo Atlas is especially good for finding natural areas all over North America. The trip out – our first in our “new” Roadtrek RV – was fairly fast and direct – about 2,000 miles straight across the country – Interstate 40 across Tennessee, Arkansas, Oklahoma, Texas Panhandle, New Mexico, and Arizona. Our first stop in California was Joshua Tree National Park, east of L.A. in the Mojave Desert, and our first chance on this trip to try to find the LeConte’s Thrasher. Maybe this would be the year. This uncommon bird lives in barren deserts with creosote bushes in Southern California, southwest Arizona, and a corner of Nevada. The National Geographic Guide to Birds of North America says it “runs with surprising speed, tail straight up, across open desert or along sandy washes. Prefers arid, sparsely vegetated habitats.” Almost like a miniature Roadrunner – rarely flying. After spending time exploring the winding trails among cactuses, creosote bushes, and of course the Joshua Trees, checking each and every one for perching thrashers, and the ground for running-around thrashers, we came up empty-handed – again. We skirted L.A. and drove up into some desert areas farther north near Palmdale, but struck out again. We managed to talk to a local birder who recommended another place farther north, near the tiny village of Mojave, west of Edwards Air Force Base. His directions included a visit to nearby Red Rock Canyon State Park in a Bureau of Land Management (BLM) off-road vehicle area, where we decided to spend some time looking. We were not exactly driving an off-road vehicle. And, I had neglected to get an exact definition of what a “wash” was, so after driving on several rocky roads, wandering on foot up and down several dry creek beds (washes), never really being sure we were in the right area, we gave it up and headed back. At one point, we even explored a higher, rockier road, which had probably never seen the likes of our vehicle. We finally headed back down and drove to Bakersfield to spend the night. Disappointed but not forlorn. And not ready to give up! One of our birding tools was a set of walkie talkies. We usually stay pretty close to each other when we’re birding. Neither of us wants to miss seeing anything – especially if there’s the possibility of a new bird. What if one of us saw it and the other one didn’t! But on occasion, we can split up and cover more territory – and keep in touch with the walkies. Well, one of those walkies wasn’t working properly, so Phil found a Circuit City store and replaced it. And good thing he did, too! We were now following directions in the Birder’s Guide to Southern California to a tiny town called Maricopa, south of Bakersfield. Maybe here our luck would change. We made our way to an area outside of Maricopa that looked pretty deserty with lots of creosote bushes, and we spent the next 2 hours walking around in seedy, weedy, brush with the seeds stabbing through our socks and shoes, making every step an agony. Up and down dry washes, under railroad culverts, around and between short bushes and tall grasses. We were now separated and using our walkies and checking in with each other every few minutes – not finding anything. I said, “Phil, if we don’t find this bird by 10 AM, we’re out of here!”. At 10 AM I came to a small isolated stand of trees, some of them dead. I could hear bird noises ahead of me, so I figured I’d try to lure them out into the open by making some shushing noises – pssshhh, pssshhh, pssshhh. Curious birds will sometimes come to these and other noises. What did I have to lose, right? Out popped a LeConte’s Thrasher. I called Phil on the walkie and tried to quietly say, “I’ve got the bird!” – trying to keep my frantic voice low and quiet. He was about 5 minutes away, but almost ran through that impossible habitat. I tried to keep an eye on the bird and not lose it – but it disappeared before he got there! Now what? Would I count the bird if he didn’t see it? I swear, I hadn’t thrown a rock at it. We waited, watched, circled the stand of trees, made the shushing noises again, got closer to the trees – we hadn’t seen it fly out. It had to be in there! Suddenly, Phil said, “There it is!” Unseen by either of us it had popped up on a snag on one of the dead trees – certainly not where it was supposed to be. Not running along the ground from one bush to another, hiding. Not perched on a low shrub, calling. So no matter what the books say, you can still always expect the unexpected from the birds. That’s probably one of the reasons birding is such a great sport. The thrasher dropped down, and we followed and saw him a couple more times, until we were sated with wonderful looks at this most elusive, very hard to find, long-tried-for bird. So that wrapped up the thrashers for us. We could now tear those pages out of the bird book. Kidding!! We treated ourselves to a late breakfast at Tina’s Café on Main Street – hash, eggs, sausages, toast, jam – certainly a proper reward for a job well done – at last. And headed on to the next adventure. Congrats on getting the bird. How in the heck could you even see him? He blends in so well. Gorgeous coloring on the underside. What a success! I just takes practice! You first started birding when you were about 4 or 5 (1980) and your mom and I took you on an adventure out onto the Pawnee Grasslands and you saw your first Rough-legged Hawk, Ferruginous Hawk, and Golden Eagle. I’m not sure how impressed you were at the time, but I know I was since they were “firsts” for me, too! Someday, we’ll have to take Sabrina! What a joy it is for me to “re-live” all those adventures! Thanks for being willing to read it all!